Schauen Sie sich den Validierungsbericht #029732 für Immunofluorescence an. 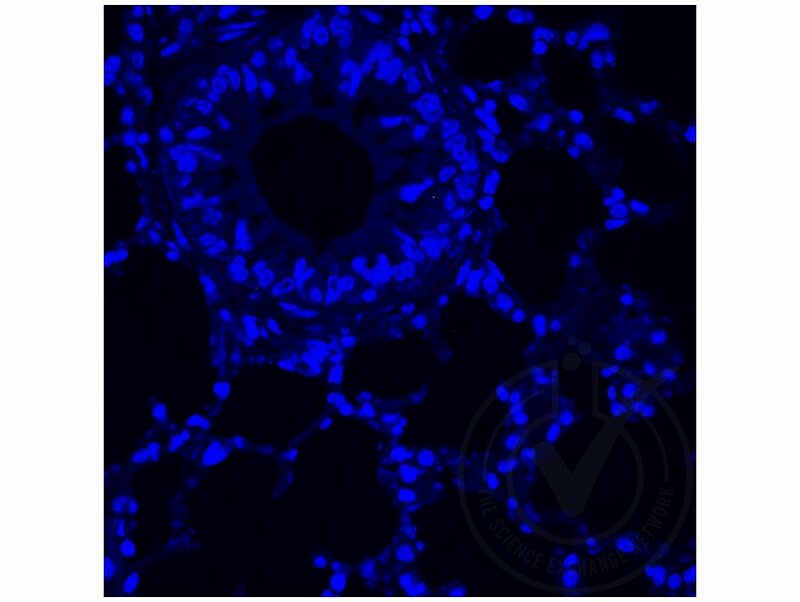 Formalin-fixed and paraffin embedded rat colitis labeled with Rabbit Anti-TNF alpha Polyclonal Antibody (ABIN677318) at 1:200 followed by conjugation to the secondary antibody and DAB staining. Bewertung Fluorescent signal is detected in positive control, but not in negative control or isotype controls. 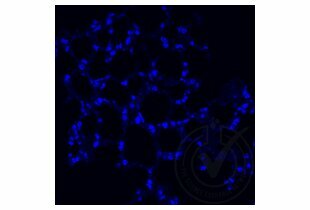 Secondary antibody only control: positive and negative control tissue sections treated with Goat anti-Rabbit Alexa 647 secondary antibody only. Any staining observed is due to non-specific binding of secondary antibody. Paraffin embedded positive and negative control tissue sections were deparaffinized and underwent antigen retrieval using 10 mM sodium citrate pH 6.0 in a pressure cooker for 10 min. The tissue sections were incubated with 1 mg/mL sodium borohydride for 10 min at room temperature to block autofluorescent background signal. The sections were then rinsed three times in TBS for 5 min each at RT. Tissue sections were blocked in 1 X TBS / 5% normal donkey serum for 60 min at RT. Tissue sections were incubated with primary antibody diluted 1:200 in 1X PBS / 5% normal donkey serum overnight at 4°C. Tissue sections were rinsed three times in TBS for 5 min each at RT. Cells were incubated with secondary antibody diluted 1:200 in 1X PBS / 5% normal donkey serum for 60 min at RT in dark. Coverslips were mounted on slides with Prolong Gold anti-fade mounting media (Invitrogen). 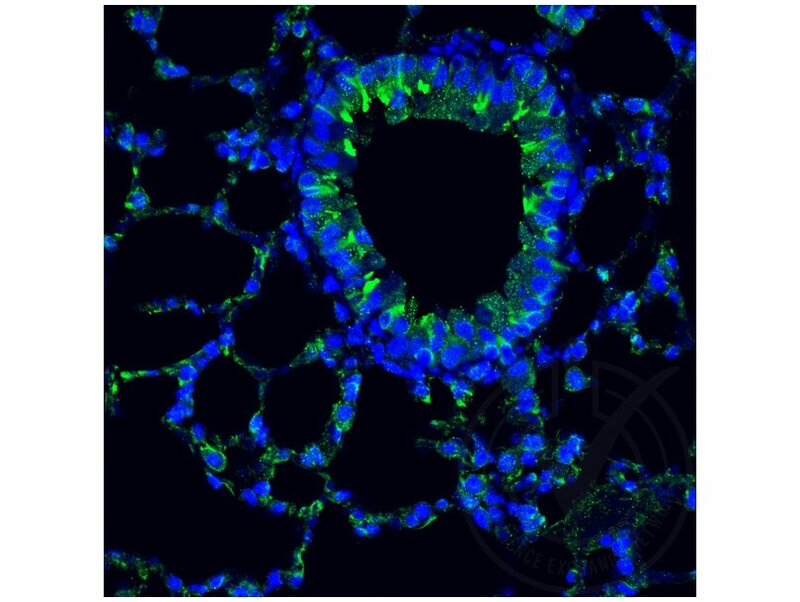 IF stained tissue sections were imaged with a Zeiss LSM 510 Meta confocal microscope. 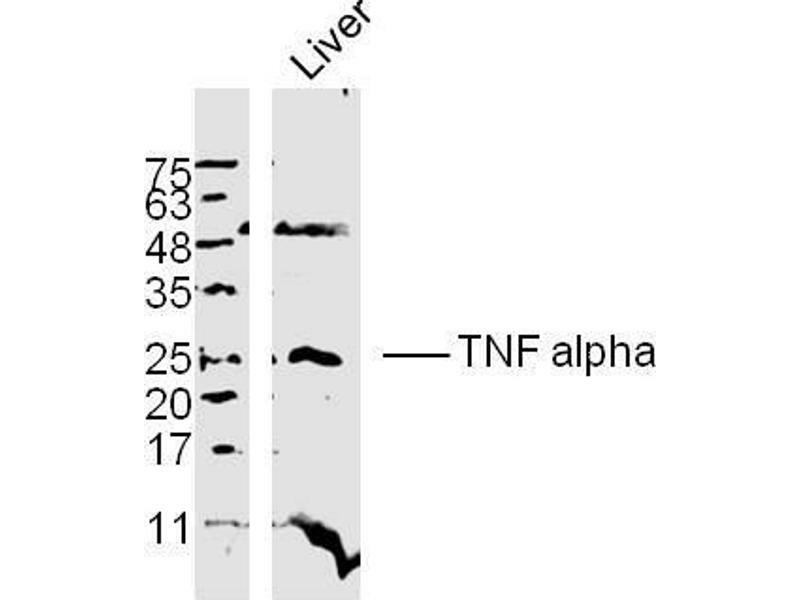 Cytokine that binds to TNFRSF1A/TNFR1 and TNFRSF1B/TNFBR. 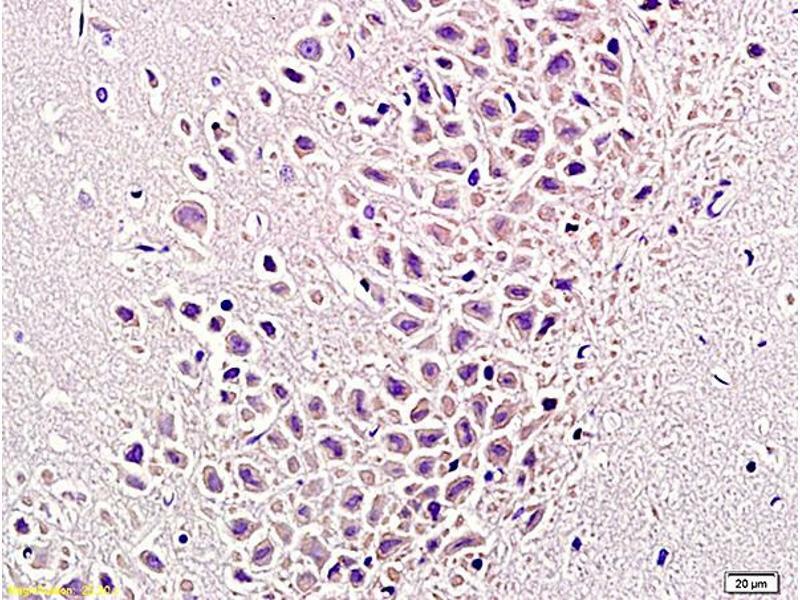 It is mainly secreted by macrophages and can induce cell death of certain tumor cell lines. It is potent pyrogen causing fever by direct action or by stimulation of interleukin-1 secretion and is implicated in the induction of cachexia, Under certain conditions it can stimulate cell proliferation and induce cell differentiation. The TNF intracellular domain (ICD) form induces IL12 production in dendritic cells. 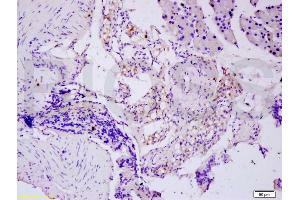 Formalin-fixed and paraffin embedded rat colitis labeled with Rabbit Anti-TNF alpha Polyclonal Antibody at 1:200 followed by conjugation to the secondary antibody and DAB staining. 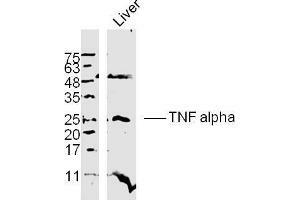 Mouse liver lysates probed with TNF alpha Polyclonal Antibody, unconjugated at 1:300 overnight at 4°C followed by a conjugated secondary antibody at 1:10000 for 90 minutes at 37°C. Produkt verwendet in: Wang, Tang, Shen, Chen, Chen, Luo, Ge: "Hepatocyte growth factor (HGF) optimizes oral traumatic ulcer healing of mice by reducing inflammation." in: Cytokine, Vol. 99, pp. 275-280, 2018 (PubMed). Von den Autoren verwendete Methode: Immunohistochemistry (Paraffin-embedded Sections) (IHC (p)) (Probematerial (Species): Mouse (Murine)). Dong, Zhou, Ji, Pan, Zheng: "AG1296 enhances plaque stability via inhibiting inflammatory responses and decreasing MMP-2 and MMP-9 expression in ApoE-/- mice." in: Biochemical and biophysical research communications, Vol. 489, Issue 4, pp. 426-431, 2017 (PubMed). 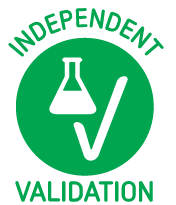 Von den Autoren verwendete Methode: Immunohistochemistry (Frozen Sections) (IHC (fro)), Immunohistochemistry (Frozen Sections) (IHC (fro)) (Probematerial (Species): Mouse (Murine)). Han, Wang, Qin, Xia, Wu: "LPS alters the immuno-phenotype of glioma and glioma stem-like cells and induces in vivo antitumor immunity via TLR4." in: Journal of experimental & clinical cancer research : CR, Vol. 36, Issue 1, pp. 83, 2017 (PubMed). Von den Autoren verwendete Methode: Western Blotting (WB) (Probematerial (Species): Human). Wang, Li, Wei, Xu, Chen, Song, Lu, Wang: "Targeted knockout of TNF?? by injection of lentivirus?mediated siRNA into the subacromial bursa for the treatment of subacromial bursitis in rats." in: Molecular medicine reports, Vol. 12, Issue 3, pp. 4389-95, 2015 (PubMed). Sun, Zeng, Cao, Song, Zhang, Liu: "Vibration Training Triggers Brown Adipocyte Relative Protein Expression in Rat White Adipose Tissue." in: BioMed research international, Vol. 2015, pp. 919401, 2015 (PubMed). Von den Autoren verwendete Methode: Western Blotting (WB) (Probematerial (Species): Rat (Rattus)). Xu, Zhao, Lin, Wang, Hu, Jiang: "Role of Dectin-1 in the innate immune response of rat corneal epithelial cells to Aspergillus fumigatus." in: BMC ophthalmology, Vol. 15, pp. 126, 2015 (PubMed). 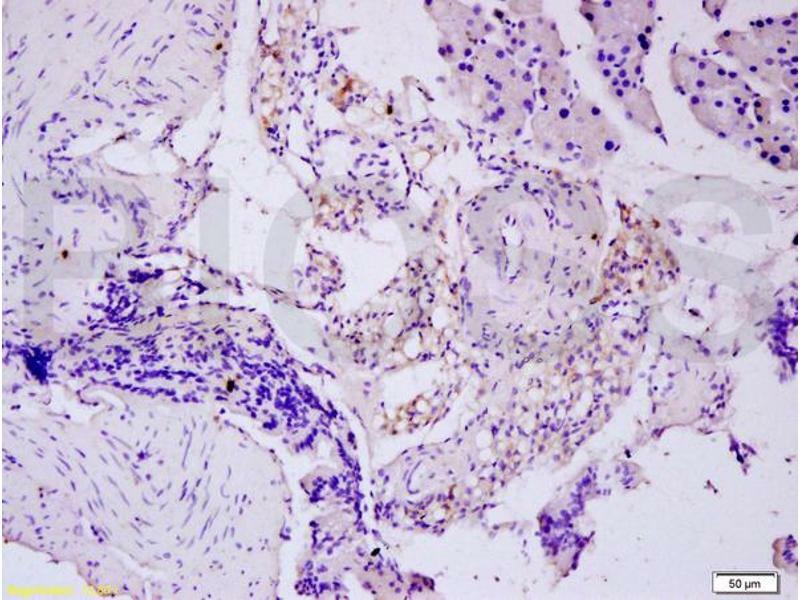 Von den Autoren verwendete Methode: Immunohistochemistry (Paraffin-embedded Sections) (IHC (p)) (Probematerial (Species): Rat (Rattus)). Morishita, Oku, Horie, Tonari, Kida, Okubo, Sugiyama, Takai, Hara, Ikeda: "Systemic simvastatin rescues retinal ganglion cells from optic nerve injury possibly through suppression of astroglial NF-?B activation." in: PLoS ONE, Vol. 9, Issue 1, pp. e84387, 2014 (PubMed). 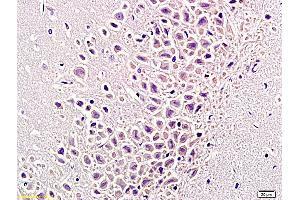 Von den Autoren verwendete Methode: Immunohistochemistry (Frozen Sections) (IHC (fro)) (Probematerial (Species): Rat (Rattus)). Wang, Hu, Wang, Gu, Gao, Cao, Zheng: "5-Aminolevulinic acid-mediated sonodynamic therapy reverses macrophage and dendritic cell passivity in murine melanoma xenografts." in: Ultrasound in medicine & biology, Vol. 40, Issue 9, pp. 2125-33, 2014 (PubMed). 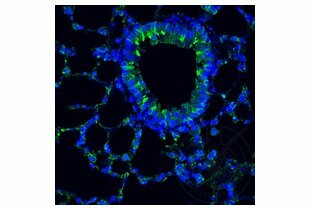 Von den Autoren verwendete Methode: Immunohistochemistry (Paraffin-embedded Sections) (IHC (p)) (Probematerial (Species): Mouse (Murine)).